I WANT TO help folks to find something new and exciting to do and experience. That's why I I have formed my charitable organization and named it the "Community Action Team" -- a name that I feel encompasses all the varied activities and events that I have (and will continue to) organized for the good of our community. Justin Rudd coaches pageant contestants and teaches fitness. He also cleans up beaches, raises money for charities and helps animal shelters. IT IS NOT a response Justin Rudd expects from a would-be Miss America . "Now see," he tells Miss Nevada, "you want to be yourself, that's part of your charm … but still bring out the positive." RUDD'S CLIENTS INCLUDE Mrs. America 2006 — whom he will coach again for this spring's Mrs. World competition in Russia — and Miss California USA, now vying for Miss USA . He has made a part-time career out of guiding contestants toward success. In Belmont Shore , a coastal neighborhood in the state's fifth largest city, Rudd is most widely recognized as an activist who has led thousands of residents to community service. 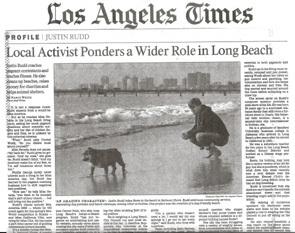 "Justin gives people free snacks, hosts bulldog beauty contests, eschews cellphones," said Christopher Ward , naturalist for the city's El Dorado Nature Center Park , who also runs Long Beach 's Adopt-a-Beach program. Rudd "has put together an entertaining and useful website, actually cares about making the city more livable and somehow exudes both creativity and integrity, wrapped up in a ton of energy." But Rudd — a savvy self-promoter — is on the verge of entering the often bruising field of local politics. He is weighing a Long Beach City Council run and must decide by the Jan. 11 deadline. Supporters who volunteer at his nonpolitical community events — he has 14 websites linked via http://www.justinrudd.com — ; say his ability to mobilize thousands of residents could only grow with public office. The 3rd Council District includes about 50,000 residents in Belmont Shore , Belmont Heights , Naples and the eastern flank of Long Beach near the Orange County line. Fans, including Beth Barnes, president of the Long Beach chapter of Surfrider Foundation, see Rudd as a community leader. The national environmental group and others — parents and pageant contestants, a producer of a sea otter documentary, an airline rep and some Girl Scouts — were spending a recent Saturday sifting for cigarette butts and other trash on the beach. "I look to Justin," Barnes said, "as our unofficial ombudsman of Belmont Shore ." Rudd laughs. "Oh, I think Rosie 's more popular than me." "He does [volunteer work] every month, year after year," said Tommy Kha , a consultant with the Hitachi Corp. who first volunteered for the beach cleanup years ago as a student. "He's like this role model to live by." 1 Justin loves chocolate chip cookie dough and can make it from memory and from scratch. Usually, he has some frozen dough in the freezer. 2. He founded and directs a 501c3 nonprofit organization called the Community Action Team (CAT). 3. Has a business degree from Samford University -- a private Southern Baptist school in Birmingham. 4. Justin received the 2004 Outstanding Young Californian award presented by the CA Jaycees Foundation. 5. He orchestrated the community candlelight vigil, which, organized in only 48 hours, brought an estimated 5,000 people to Long Beach's World Trade Center the Friday following Sept. 11. 6. Lived the first 26 years of his life in Southeast Alabama (near Florida and Georgia). He was born and raised in the town of Ozark (spelled backwards is KRAZO), population 15,000. 7. Has lived in California since 1995. 8. Elected and served as class president all four years of high school and his senior year in college. 9. Was in Lambda Chi Alpha fraternity in college and was elected as Brother of the Year his junior year. He also served as social chairman, secretary and v.p. 10. Elected Homecoming King by the student body his senior year in college. 11. Helps women to prepare for pageant interviews (including Miss USA, Miss Teen USA and Miss America contestants). Every week he e-mails pageant practice questions to 5,000 women around the world. subscribe. 12. Sometimes people tell him he looks like Peter Krause from "Six Feet Under." 13. Sleeps with the noise and air circulation of a fan on high! 14. Broke his leg when his bike slid on a pile of leaves on the family's steep driveway. Was in a body cast and in traction in the hospital when he turned 6 years old. During recovery, his family pushed him around in a green wheelbarrow. 15. On Feb. 9, 2005 Justin received the statewide Environmental Volunteer of the Year Award presented by Keep California Beautiful. He also received the Outstanding Environmental Achievement Award from the EPA in 2005. 16. Graduated fifth (of 219) from Carroll High School in Ozark, AL in 1987. He was president of the National Honor Society; received top subject matter awards for musical theatre and choral music; was in Mu Alpha Theta (math honor society), the Spanish honor society, Key Club, Fellowship of Christian Students, madrigal singers, and Future Business Leaders of America; took all honors and AP classes that were offered; was founder and president of the Bleacher Screechers pep club. CLICK: MORE RANDOM FACTS ABOUT JUSTIN RUDD! Subscribe to Justin Rudd's FREE Five-A-Week Club. Get 5 pageant interview practice questions evey week. Get the free tool that winners have used time and again.